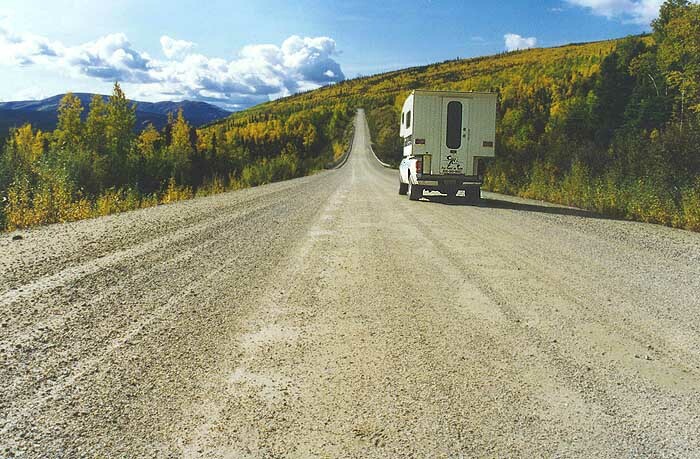 the Elliott Highway northwest to Manley Hot Springs, The Dalton Highway ('Haul Road') north to Deadhorse and Prudhoe Bay, the Steese Highway east to Circle City, the Parks Highway southwest to Denali Park and Anchorage, and the Richardson Highway south to Delta Junction and Valdez. Trucks travel fast on the 'Haul Road', the Dalton Highway to Deadhorse and Prudhoe Bay, 414 miles alongside the Trans-Alaska Pipeline. It's a rough ride, most of the road is gravel, a few stretches have a black top. Dust can be a problem. Calcium chloride is used on the road to control the dust. 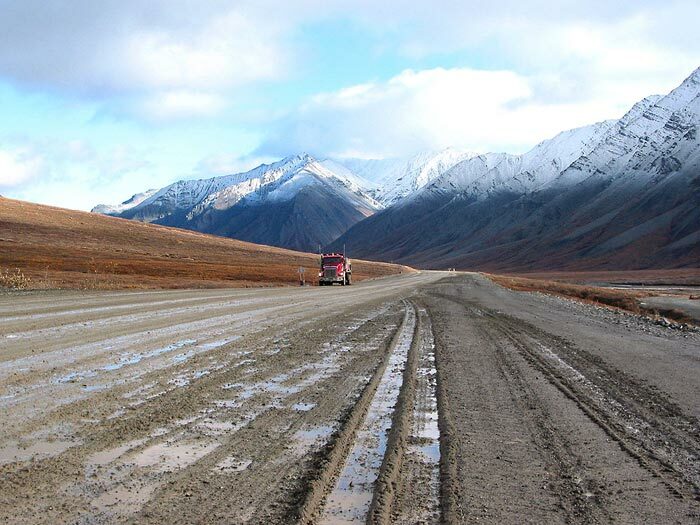 Most of the Dalton Highway runs north of the Arctic Circle and passes Coldfoot truckstop and the old goldrush town Wiseman. 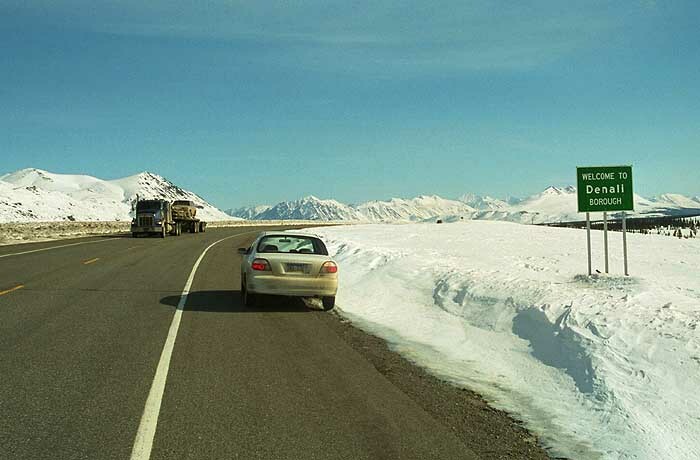 The road crosses the Brooks Range, and Atigun Pass at MP 244 is the highest highway pass in Alaska (elevation 4.800 feet or 1.463 meter). Fall colors on the Steese. 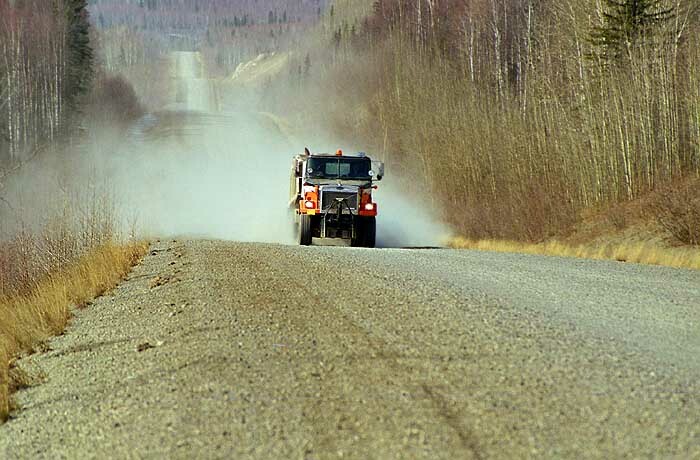 The first 44 miles of the Steese Highway are paved, it's gravel and dirt the rest of 162 miles to the Yukon River at Circle City. Highlights are Eagle Summit (3.624 ft.), the town of Central, and Circle Hot Springs resort. The Elliott Highway officially starts at Fox, just north of Fairbanks. It's a 152 miles scenic drive over ridges and hills to Manley Hot Springs on the Tanana River. Only the first 30 miles are paved. The George Parks Highway connects Fairbanks with Anchorage. It's also the main access road to Denali National Park and Preserve. On -or close to- the highway are Ester, Nenana, Healy, Cantwell, Talkeetna, Willow, Wasilla and Palmer. All 358 miles are paved. Igloo City, a gas station, truck & hellicopter stop, and roadside attraction on the Parks Highway (mile 188.5), constructed in the 1960's. It is Alaska's largest igloo. 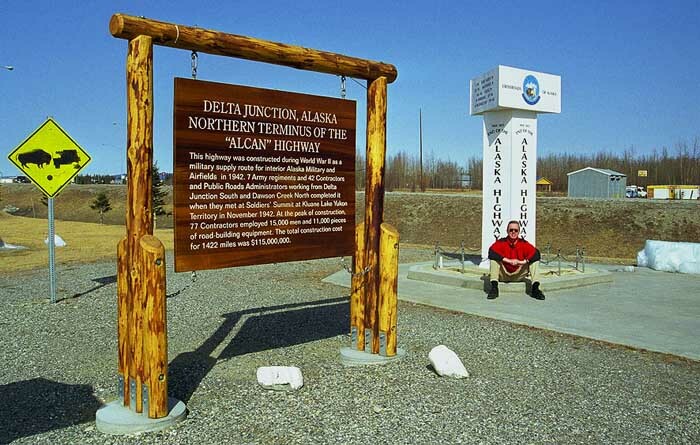 Delta Junction, where the Richardson Highway meets the Alaska Highway, or 'Alcan'. 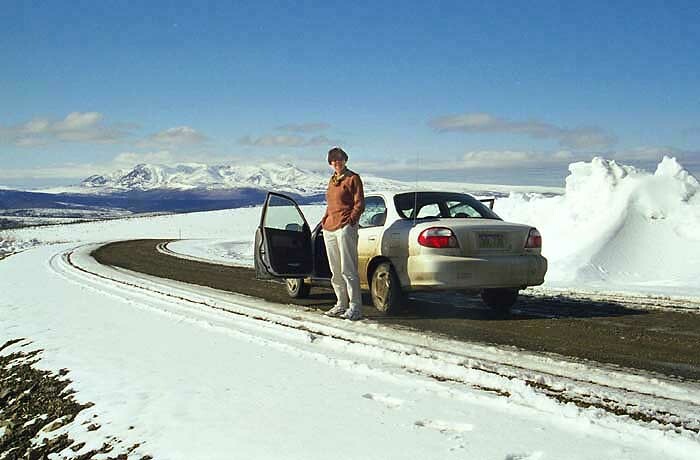 The Richardson Highway was Alaska's very first road. Today it's a 368 miles all paved highway from Fairbanks to Valdez and the Prince William Sound. The Trans-Alaska Pipeline is never far from the road.